The Pink Conch (Strombus gigas) is a gastropod mollusk that inhabits the waters of the Caribbean Sea and can be found from northern Brazil to the Bahamas. They are commonly found in rocky or sandy seabed habitats, with vegetation, and clean water from shallow to moderate depths of up to forty meters. It is an herbivorous species (Warmke and Abbott, 1961), which feeds on epiphytic seagrass and coral reefs (Randall, 1964), and the blue/green algae covering the tiny grains of sand (Jory, 1986). They have two recognized migration patterns; one associated with the reproductive process which is a short scale migration (Randall, 1964) and other related to the development and growth of the individual which takes place over a longer time span (Stoner and collaborators, 1988; Stoner, 1989). 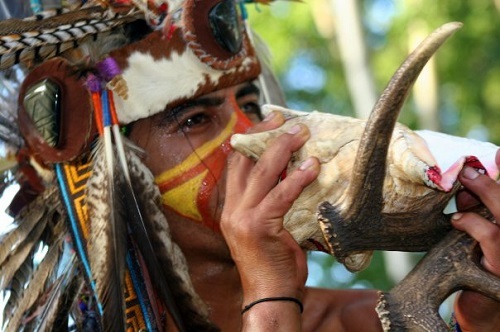 The Mayan inhabitants of the peninsula ate the pink conch flesh and used the shells as currency. This use was also practiced by other pre-Hispanic inhabitants of the Caribbean islands. The snail has a cultural and historical value, as the organism was part of the cosmic vision of the Mayan people, and has recently been given a heraldic value, as it is represented in the coat of arms for the state of Quintana Roo and in the municipality of Othón P. Blanco. There are several myths associated with the nutritional properties of the Pink Conch. Some people claim that the flesh has certain aphrodisiac properties and eating it helps to improve sexual performance. Amongst the local fisherman community it is said that eating the raw flesh without any seasoning lowers blood pressure (Culli, 2016). Research has shown that the snail does in fact have important nutritional properties, providing essential amino acids, vitamins and minerals. Its high copper content is also effective in fighting infections (Metzler y Montero, 1992). The meat contains 72 % water, 23 % protein and 3 % ash, while its fat content and crude fiber are low, making it a very healthy food option. Regarding its shell, in the Florida Keys fishermen say the snail shell or something made with it, is a good luck charm. In Key West, Florida, where it calls itself the “Conch Republic”, it is thought that someone who buys jewelry made of conch shell from there will acquire the ‘magic’ of the conch and return to the conch’s place of origin, and that the person will obtain great strength. Mollusks are an integral part of the complex aquatic interaction the Mayan people had with the sea. Two kinds of mollusks were important in the world view of Mesoamerican people. Gastropods represent the “eddies”, which are swirling pools of water or wind created when an element flows past an obstacle, and bivalves, which were used as food and decoration. However, there is another element related to snails, which is sound. Ehécatl is a deity with a voice audible to humans. The snail seems to keep itself locked in the sound, even today we say “you can hear the sea inside the snail” and that feature is more noticeable in larger snails, such as the Strombus. In fact, these snails’ “trumpets” were frequently used in the Mesoamerican ritual Quetzaltzcciztli. The Pink conchl also is the material and shape of the ehcailacacoscátl: the jewel of the wind, where the natural spiral shape is prominente (Suarez, 1991), and represents a direct image of the wind, which is evident in the manuscripts found on Ehécatl – Quetzatcoatl, who always wore one. The conchs were also used as jewelry, which is evident from the carved pieces that were found in a burial site in Belize (Hammond and Bauer, 2001) and elsewhere in Oxtankah, Quintana Roo, evidence was found of shells being used as tools. From the ecological point of view, the conchs are on the second level within the food chain, providing a link between producers and consumers. Many organisms feed on pink conchs such as dolphins, turtles, octopus, reef fish, spiney lobster and even other crustaceans such as squilidos and gastropods, for example Murex (Randall, 1964). But the biggest predator has always been man, who from the beginning of time has feed on its rich and nutritious meat, and used the shell for various aforementioned products. In order to conserve the pink conch, there must be efficient monitoring to ensure that the conservation of this resource be handled according to the law. It is also necessary to generate sound scientific information to have the technical elements needed for the management of the species. For this, monitoring should be performed throughout the year to determine population fluctuations, and whether they are natural or human-induced. Also to know the quantity of organisms in each natural area throughout its different life cycles (larval, juvenile and adult) will help find the appropriate techniques to handle and verify whether the main marine reserve areas are protecting such species. With that information, a proper management proposal can be generated according to the characteristics of the species to ensure its survival, abundance, and continued use.